There will always be an excuse for not taking a risk. And keeping the kind of blog I feel called to keep feels like a risk to me: exposing how far into the “woo” end of the pool I have gone will probably come as a big shock to a few people. What holds me back is the same thing that holds us all back, a story as old as time: fear of what others might think of me. Fear that they’ll think I’ve lost my marbles and turned my back on reason, which couldn’t be farther from the truth. But why should I fear this, when I feel the scales have fallen from my eyes and I finally have caught a glimpse of joy and peace for me in this lifetime, and decided to pursue it, and believe in it? The difficult thing is putting a name to “it” a definition for this exhilaration and lightheartedness. But the joyful thing is that I don’t feel the need to explain it, I take it as it comes and let it fill my heart with love. For years I told myself that I must have dreamed them so vividly I thought they were real, but I have decided to accept and believe that the “mystical” experiences I had as a child had a level of truth to them. The first experience: I was probably around 4 years old. The chickens at my grandma’s house had just hatched some eggs, and I managed to separate a baby chick from its mama to keep as a pet. How I took care of it is very fuzzy in my memory… which is a good indication that I had no idea what I was doing, and that’s probably why the poor thing was dead within a couple of days. I was heartbroken, and my dad took the opportunity to impart upon me a couple of important lessons. The first was that baby chicks need their mama to be well, and I shouldn’t separate them, and I should be happy enough to just pet the dog. The second lesson was that heaven and hell existed. He said that life is like a road, and at the end of the road, if we have been good, we go to Heaven, but bad people go to a very bad place called Hell. He assured me that I shouldn’t be sad, because the baby chick was absolutely innocent, therefore it went straight to Heaven. Having been a singer since before I could speak, all that singing made heaven sound like my kind of place! Dad’s word that Hell was a very bad place was enough for me and I didn’t ask any more. After our nightly prayers I started to worry. How would I get into heaven? I started to understand that I had done a very bad thing when I took the baby chick from its mama, and it had died because of my carelessness. I was no longer absolutely innocent. How could I get into heaven? These thoughts lingered in my mind as I went to sleep. The next thing I know, a sweet feminine voice is calling my name. The curtains are billowing, but I don’t feel a breeze. I feel static in the air, and the hair on my arms and at the back of my neck stands up. This memory is indelibly etched into my brain. I remember the bedspread on the bed, turquoise blue, with two red and black and yellow and white peacocks and paisleys. My sister slept beside me and didn’t stir. 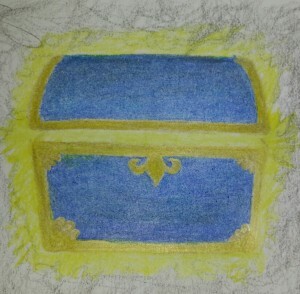 Suddenly, a flash of light and small treasure chest appears to glow, floating at the foot of the bed, vividly blue, with gold hardware. The key to heaven is in good deeds. 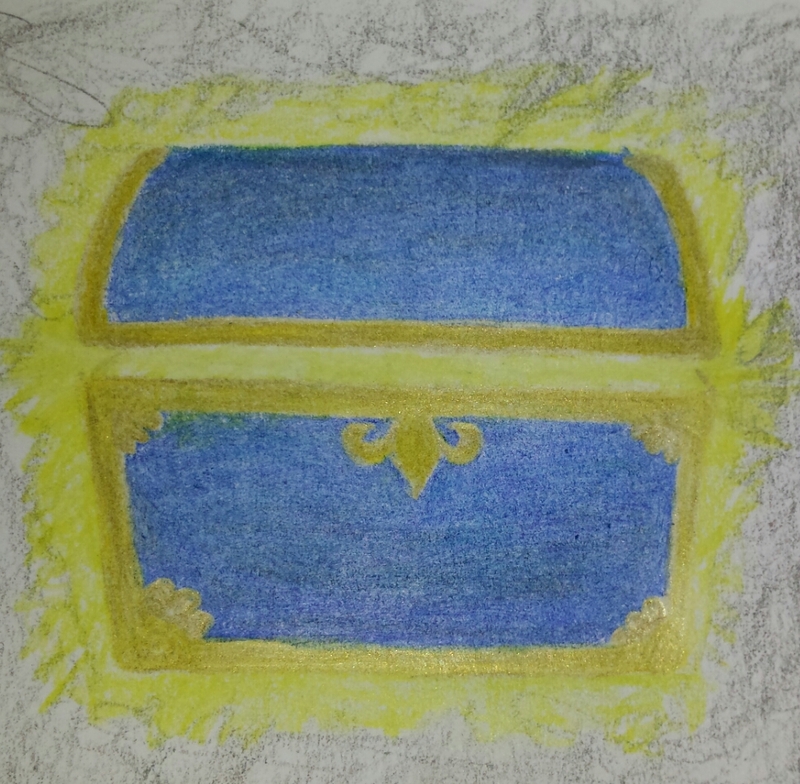 Then, the treasure chest opened, and out of it floated a large golden key, radiating light. Fast forward a few years, to the beginning of the 1990 Gulf War. When I saw it in the news, I became very very afraid. I remembered stories of young men from the neighborhood, in my grandparents’ generation, whose lives were cut short by the Vietnam War. The draft didn’t discriminate, and Puerto Rican draftees were disproportionately killed in combat, probably in part to a language barrier preventing proper training. My dad was 27 years old, but looked much younger and was very fit, and I was so afraid he would be drafted. He is a peaceful and compassionate man, not compatible with war. That night, I prayed so hard, for so long, I never said “Amen” before falling asleep. Again, I awoke to a voice calling my name, but this time it was a deep, masculine voice, so powerful I felt it in my bones, but also full of love. I felt a stirring in my heart and a lump in my throat as I sat on the bed. Again, the curtains were billowing although the wind was calm that night. Have no fear. The Holy Spirit is with you. This may have been the first time in my life I wept tears of joy. The draft never happened, so I never needed to be afraid in the first place, but the Divine had spoken to me, and taken my fear away. The memory of these experiences sustained my faith, even though I rarely went to church. They carried me through difficult times in my adolescence, when my struggles with depression first surfaced. I always felt connected to the divine energy when I was in nature, and when I was singing, but never more than when singing in nature. So that’s what I did whenever I needed comfort. I went outside and sang, and I felt the Holy Spirit within me. Next time, I’ll tell you the story of how I stopped singing for a long, long time. This entry was posted in Uncategorized and tagged in faith, memoir, original artwork, spirituality, visions. « Why I believe again, part 1.